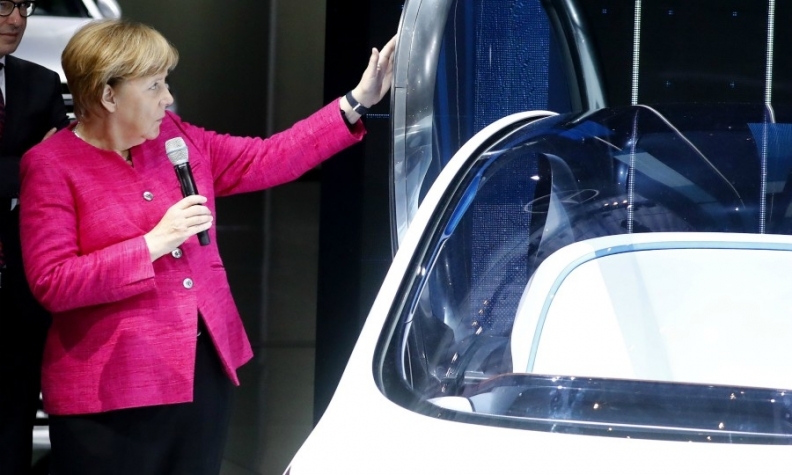 Angela Merkel examines a Smart car at the Frankfurt auto show on Thursday. FRANKFURT -- Chancellor Angela Merkel said Germany's car industry should do everything in its power to repair its damaged reputation, pointing to the combustion engine's uncertain future as she opened the Frankfurt auto show. The auto sector -- Germany's biggest exporter and employer of more than 800,000 people -- was plunged into crisis two years ago when Volkswagen Group admitted to cheating on diesel-emissions tests. "A lot of trust has been destroyed. That is why the industry must do everything to win back confidence, in its own interest and that of employees and German industry," Merkel told the meeting of top car executives last Thursday. The chancellor noted that the emissions scandal broke just after she opened the same show two years ago. The industry now faces many more challenges, including suggestions that China might eventually ban combustion engines, she said. Ahead of a national election on Sept. 24, Merkel has come under fire for her close ties to automakers and for failing to crack down on vehicle pollution following VW's admissions and push the industry to move into electric vehicles. VW, BMW, Daimler, Audi and Porsche have since come under investigation by European regulators for alleged anti-competitive collusion. The chancellor has taken a tougher line on the industry in recent weeks and pushed it to agree measures to help tackle pollution in cities, this month setting up a 1-billion-euro fund to clean up urban transport. Last Thursday, she urged foreign carmakers to join a deal with German manufacturers to overhaul engine software on diesel cars to cut pollution. She also reiterated her opposition to bans on diesel cars under consideration by courts in some German cities. Anton Hofreiter, parliamentary leader of the environmental Greens, said Merkel had contributed to the crisis by protecting the industry and allowing Germany to fall behind. "With her speech, Mrs. Merkel is indicating toward the future, but the actions of her government mean she is still parked on the [hard] shoulder," he said. "The next government must get serious with the modernization of the auto industry." The Greens, currently only on about 8 percent in the opinion polls ahead of the election, want Germany to stop the sale of new combustion engine vehicles from 2030. Britain and France have recently announced plans to eventually ban all diesel and gasoline vehicles by that year. Matthias Wissmann, head of Germany's VDA auto lobby that hosts the car show, admitted the industry had not made things easy for its political allies. Wissmann, a former member of Merkel's conservatives and federal transport minister from 1993 to 1998, said regaining trust was the top priority, but also said the whole sector and its employees should not be condemned for the acts of a few. Merkel predicted that the combustion engine will survive as demand was booming in many parts of the world, while she said German automakers were still innovation leaders, accounting for a third of patents for electric and hybrid cars. "It is clear that we will still need combustion engines for decades, while also investing in new motor technologies at the same time," she said. Last Wednesday, auto suppliers and manufacturers said Europe should not rush to abandon the combustion engine and must build up its own production of electric car batteries to compete with China.